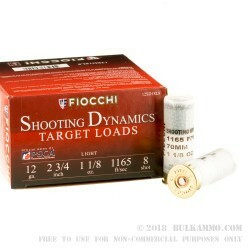 Pick up a case of 250 rounds of 12 gauge ammo from Fiochi, and you will be set for a day at the range. 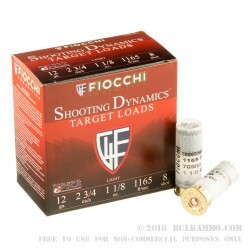 This ammo is part of Fiocchi's Shooting Dynamics line which was created to have a high quality shell that everyone can afford. 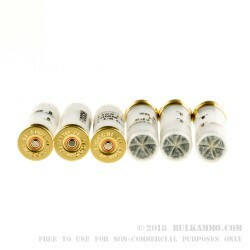 This ammo uses only top quality components including one-piece shot cups, cushioned wads, clean burning powders, and Fiocchi's world renowned primers. This target load features a 2-3/4" shell loaded with 1-1/8 oz of #8 shot and has muzzle velocity of 1165 feet per second. 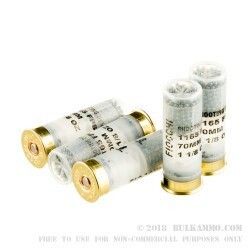 If you are looking for reliable and affordable ammo for your clay target shooting needs, then look no further. Fiocchi has been manufacturing high quality ammunition since 1876, and is trusted by many professional shooters around the world!